Welcome back to the work week, ladies! Did everyone survive your weekend festivities?! Any good must tell stories? I sure hope you all had a very lovely few days to relax a recover! Well, I made it back to Kansas City after spending a busy weekend with my family at home. We had a great time celebrating the world's greatest little sister! Once we got home lats night, I was so pooped that I don't think I left the couch for 4 hours. A girl has to catch up on her DVR, right? Anyway, I'm glad you decided to stop by for a visit. I don't think you all know how much I love your sweet comments! I plan on being super active this week - because I have lots of great things to share! Make your Monday count, girlies! Hopefully my computer stops being dumb and I can actually see the blogs!! This is soooo not fun when you can't go mingle! thanks for hosting meg! can't wait to check out the other blogs. twentyfivebeforetwentyfive - talked about her love and not love of fall - I can relate to both sides as well! Thanks for hosting. I love recipes, fashion, decorating, travel, real housewives, furnishings, etc. 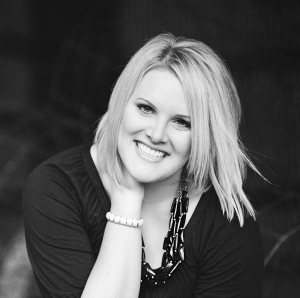 I joined a few new blogs today from your hop! Stopped by 25 before 25 and realised she is starting French classes which is on my list (not before 25 though as I'm 26 lol!). I love quote posts, life quotes and those which make me think. Hello! =) I love posts about decorating & fashion! But when you write about your life, that's great too! I stopped by Bowling Adventures where she met a fellow blogger friend! I just think that's awesome and hopefully that will happen to me someday! I love posts about decorating. 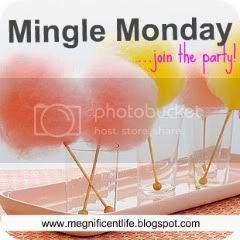 I love mingle monday. Such an easy way to be exposed to great new blogs! I just started following your blog a week or so ago and this is my first Mingle Monday. Love it! Thanks for hosting! I'm a new follower and would love it if you could follow me back! I love posts about fashion, cooking..recipes! Hi Meg! Thanks again for hosting! I love the blog hops, new recipes, and fashion and decorating advice. I visited A Tall Order: she recapped her family vacation so far, including a great run and a strange haircut. At Laugh Until Your Cheeks Hurt, they've moved to a new town and are getting settled in. I've stopped by many of the blogs listed already and they are so far very fabulous! Loving all of your blogs, ladies! I stopped by Bowling Adventures where she talked about the tailgate she went to and the yummy sounding foods she made. My mouth is watering! I also stopped by On the Front Porch and she talked about Fall Traditions. I need to get on my pumpkin spice latte kick like now!